With summer just around the corner, it’s time to break out the sunscreen, uncover the patio furniture and start up the grill. However, before you can start to enjoy your deck this summer, you’ll need to break out your cleaning supplies and clean your patio furniture. To keep your patio furniture in pristine condition, you’ll need to know how to clean patio furniture. You need to remember to wash it often and keep it inside in the winter to keep it from staining. Patio furniture comes in a variety of materials, all of which require different methods for cleaning. This article provides you with the simple steps to help make sure you are using the right supplies and getting your furniture ready for the summer, no matter the material. 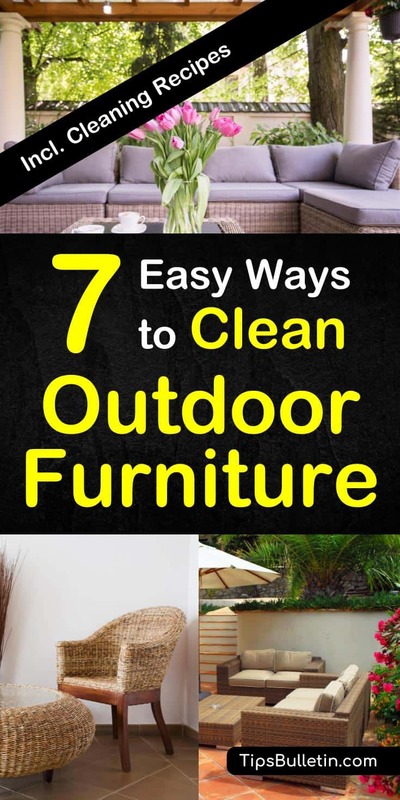 Read on and learn how to clean outdoor furniture. Teak Wood is an ideal material for your patio furniture because it is durable and doesn’t take much in the way of cleaning and maintenance. Teak patio furniture will either be treated with teak oil or finely sanded to show off its natural form. Even though teak is naturally resistant to rot and mold, if not properly cleaned, mildew can still form on the surface of the furniture. To prevent your Teak patio furniture from becoming discolored and succumbing to mildew build-up, you want to make sure you are cleaning it on a regular basis. The following tips are based on one of our natural homemade deck cleaner recipes and will provide you with ways to keep your teak furniture looking like new. Use one of two easy homemade cleaning solutions — either vinegar and warm water, or chlorine bleach, laundry detergent, and warm water. Apply the homemade cleaning solution to the furniture using a soft plastic brush, making sure to scrub the wood as you go. Avoid using a metal brush as it will damage the wood’s surface. Allow the mixture to sit for about fifteen minutes, before rinsing thoroughly with water. If your Teak furniture has seen a lot of exposure to the elements, you’ll want to look for a more aggressive, store-bought solution to clean the pieces. Wicker furniture is made from a tropical climbing plant known as rattan and has been the go-to choice for decks, patios, and porches for hundreds of years. The weaving technique that is used to create the wicker furniture makes it an excellent choice for your patio furniture and doesn’t require much care, and is easy to clean. The following are some simple steps for how to clean wicker furniture to ensure you can use it for years to come. From time to time, use a vacuum to get out the dust, dirt and even spiders out that tend to settle in the crevices of the furniture throughout the year. To prevent the excessive buildup of dirt in the crevices, use a low-pressure hose every few weeks to clean the furniture. After you hose off the furniture, you’ll want to inspect the weave to make sure that it hasn’t moved from its place. You can use your finger to set it back if you find that it has moved. If you determine that the vacuum didn’t remove enough of the dirt, or if your wicker is heavily soiled, use a sponge and a mild oil-based soap, like Murphy’s Oil Soap, and some warm water to remove the stubborn dirt. Rinse it off and allow it to dry. To avoid unnecessary damage, avoid using foam cleansers because the foam can get into the woven strands and begin to collect, causing it to deteriorate. Never sit on damp wicker furniture, as you might cause the wicker to sag. 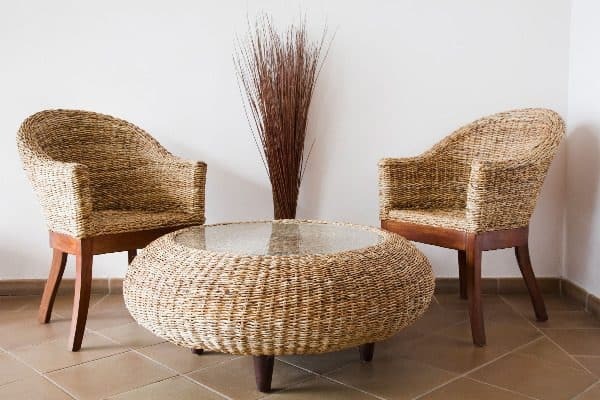 Rattan is an eco-friendly material that is durable, attractive, and lightweight and often mistaken for bamboo. It is a trailing, vine-like palm that is found in the jungles of China, Malaysia, and Asia and has been used to make furniture since the mid-twentieth century. While you can use rattan furniture outdoors, if left outside in the elements for too long the material will break down. 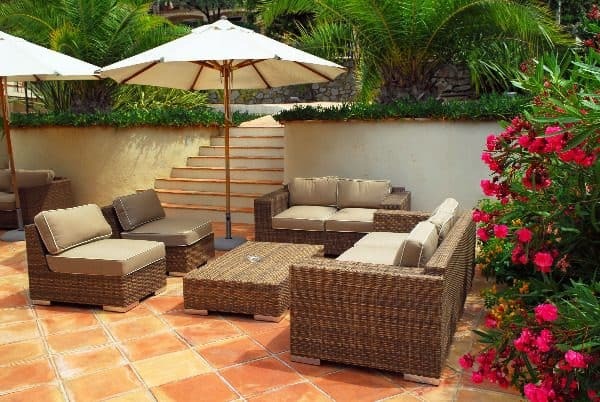 To keep your rattan patio furniture looking great, here are some simple steps for cleaning it. Place water in a bowl and add a few drops of dish soap, stirring it vigorously, so bubbles form on the surface of the water. Using a soft cloth, dip it into the bubbles, avoiding making direct contact with the water. Wipe down all the surfaces of the furniture with the cloth. Avoid over wetting the rattan as it can result in damaging the material. Clean the cracks and crevices of the furniture using a soft brush or toothbrush. Use the suds-only method to accomplish this. To clean the furniture more thoroughly, or if you need to remove stains from the furniture, apply detergent to a soft brush and scrub with a bit more water than you used for the routine cleaning. Once done, place the furniture in the sun, or use a hair dryer to dry the furniture completely. For added protection, when the furniture is completely dry, use a paintbrush to apply a thin coat of lacquer. If your rattan patio furniture has become split, cracked, or dry, use boiled linseed oil, using a soft brush to apply it. Cleaning your rattan patio furniture on a weekly basis will help keep the furniture looking great and slow aging process. 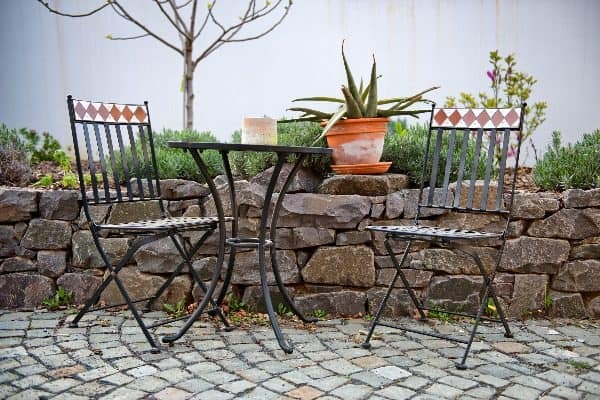 Lighter than cast iron, wrought iron can be easily manipulated to create beautiful, sturdy furniture for your outdoor space. Manufacturers often use wrought iron for outdoor furniture and fencing because of its superior strength, durability, and low-maintenance. Wrought iron furniture’s weathered appearance can help add a lot to your home décor. To maintain the color of your wrought iron furniture keep it looking like new, it is important to clean it, using the following steps, every couple of months while in use. For extra protection, use spray wax once a year. Move the furniture away from dirt, grass, and plants to avoid splashing mud onto it when you are cleaning it. Hose the furniture down to remove the loose dust and dirt. Put a quarter-sized drop of dish soap on a sponge and wipe the furniture down, using a circular motion. Frequently rinse the sponge, adding more dish soap when needed. If the furniture is particularly dirty, use a scrub brush to get to the hard-to-reach areas on the furniture. Rinse the soap and any remaining dirt from the wrought iron furniture using a hose. If you notice areas that have become chipped, rusted, or stained due to overexposure to the elements, sand the areas with sandpaper and repaint the furniture. Keeping your wrought iron furniture looking like new, take the time every couple of months to clean it using the steps listed above. To avoid rusting, be sure to cover the furniture during the rainy and snowy seasons. The heavy, durable nature of cast iron has made it a favorite material for patio furniture. Cast iron patio furniture tends to be more expensive than aluminum or plastic furniture because it often lasts much longer than its counterparts. To help prevent rust and retain the durability of the furniture, you want to clean it on a regular basis. It takes very little time to clean cast iron furniture properly, and you don’t have to purchase any expensive materials. To help you maintain your cast iron patio furniture, follow the steps below so you can enjoy it for years to come. Pour mild detergent and lukewarm water into a bucket and mix thoroughly. Use the cleaning solution to dampen the sponge, shaking out any excess water. Beginning at the top of the furniture and working your way down, wipe the entire surface of the furniture. To get into the intricate detailing and crevices of the furniture, use an up and down motion when wiping it down. Continue to wet the sponge as needed, shaking out the excess water to keep it from dripping. With a bucket of cold, clear water, use a sponge to work from the top to the bottom of the furniture, making sure to wipe away all the cleaning solution. Be certain the sponge is extremely wet to ensure no residue is left. Using a soft, lint-free towel, dry the furniture. Inspect the furniture frequently to catch any rust, and clean it regularly using the steps above. Its durability, hardiness, and ease of maintenance are one of the greatest advantages of plastic patio furniture. Its low cost and ability to resist rot and rust make it a popular choice for many homeowners. The downside to this type of furniture is that if it isn’t properly cleaned and maintained it could fade and become brittle if left out in the heat, so cleaning plastic lawn chairs is important if you want your furniture to remain in good shape. The following steps will help you keep your plastic patio furniture clean so you can continue to enjoy it for years. To remove surface dust from the furniture hose it down with cold, clear water. Dip a sponge in one of the homemade cleaning solutions, and scrub the furniture down. You can use a toothbrush to clean spaces that are hard to reach. Thoroughly dry the furniture with a towel to avoid leaving unsightly water marks. To restore the shine of the furniture, you can spray WD-40 onto the plastic and wipe down with a clean cloth. The trick to keeping your outdoor plastic furniture beautiful and durable is to clean it as soon as you notice the dirt. The longer you wait to remove the dirt, the more difficult it will be to clean it. Without the cushions, your patio furniture would be all but useless. Just like with the rest of the furniture, your cushions need some TLC after a long winter with the elements. Not just washing or cleaning might be needed, but some extra search to get rid of any bed bugs might be a good idea. On some garden furniture, especially if cushions and mattresses are left outside, check for grass stains and especially urine stains from your neighboring cat’s last visit. Urine stains on cushions or mattresses are easy to get rid of. Using basic cleaning ingredients is the best way to bring new life back to your cushions. To remove oil stains from your cushions just follow our guide here. The following steps will help you clean the cushions of your patio furniture so you and your friends can enjoy them all summer long. Using a spray bottle and mixing dishwashing soap, Borax, and warm water, saturate the material of the cushions. To get rid of any mold or mildew, be sure to soak both sides of the cushion generously. Allow the pieces to completely dry. This process should take about fifteen minutes. Once the cushions are dry, use a garden hose to spray off the solution and remove any dirt. Stand the cushions up so they can dry. When the cushions are nearly dry, spray them with a fabric protector. The fabric protector will help protect your cushions from the elements and will make cleaning them in the future easier. As you get your backyard ready to show off to your friends and family, don’t forget to take care of your patio furniture. After a long winter out in the elements, it needs a little TLC. Whether your furniture is wood, metal, or plastic, I’ve shown you how to clean and maintain it so you can use it for years to come. 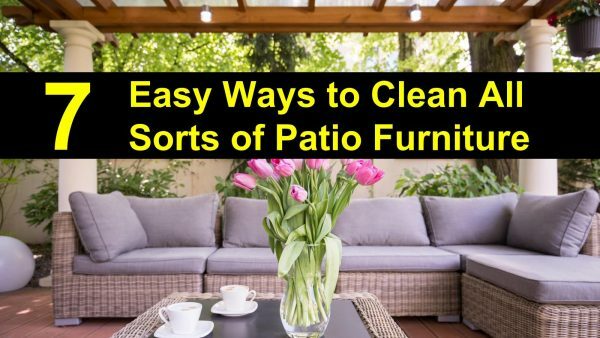 In this article, you learned how to clean outdoor furniture. You learned about a variety of types, from how to clean wicker furniture to how to clean Teak furniture and even how to clean outdoor cushions. I hope you find the information in this article helpful.